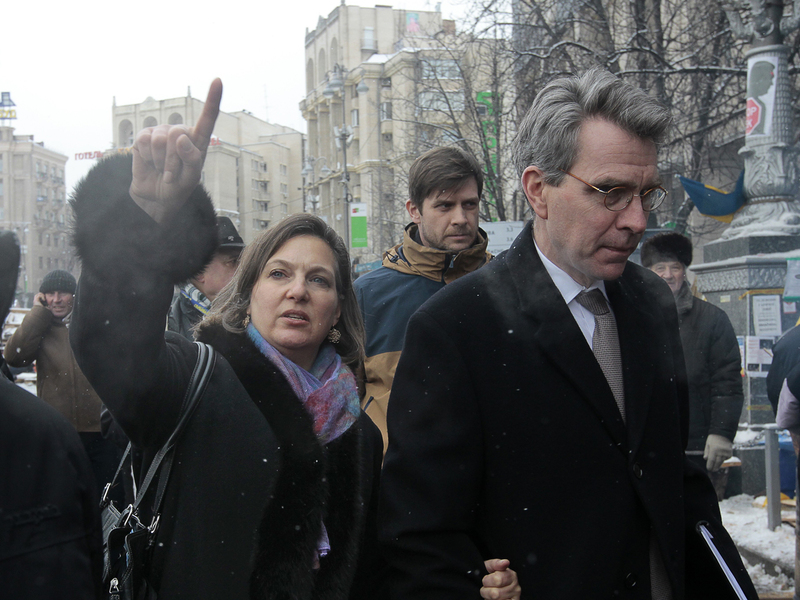 KIEV -- U.S. Assistant Secretary of State Victoria Nuland visited Independence Square in the Ukrainian capital Kiev on Wednesday, the U.S. embassy said, and an opposition leader said she talked to protesters. A spokesman for the embassy said she had visited Maidan, where several thousand of protesters were calling for the resignation of President Viktor Yanukovich. Nuland’s highly symbolic appearance in the square came a day after Secretary of State John Kerry issued a strong statement, expressing the United States' "disgust with the decision of Ukrainian authorities to meet the peaceful protest ... with riot police, bulldozers, and batons, rather than with respect for democratic rights and human dignity." "This response is neither acceptable nor does it befit a democracy," said Kerry, urging authorities to show "utmost restraint" and protect human life. "As church bells ring tonight amidst the smoke in the streets of Kyiv, the United States stands with the people of Ukraine. They deserve better." Nuland was in Kiev, along with EU foreign policy chief Catherine Ashton, to try to talk to the government and the opposition to work out a solution to the crisis. The U.S. Embassy in Kiev told CBS News that Nuland met Wednesday morning with Yanukovych and was planning to deliver a statement outside the Presidential Administration building. Photos posted on Twitter showed Nuland shaking hands with security personnel and there were many reports that she had helped distribute food to the protesters. Meanwhile, CBS News correspondent Clarissa Ward reported that police had pulled back Wednesday morning after an overnight confrontation in which they attempted to remove barricades and tents from a protest camp and scuffled with demonstrators. The standoff went on for nine hours. Buses carrying police drove away from Kiev's Independence Square early Wednesday to cheers from protesters. Another group of police that had been stationed outside the Kiev city hall building, which has been occupied by protesters for weeks, also departed from the scene. Arseny Yatsenyuk, a top opposition leader, called it "a great victory." Protesters have been gathering around the clock to demand the resignation of the government in a crisis that is threatening the leadership of President Yanukovych. The protesters, who see Yanukovych as being too close to the Kremlin in Moscow, took to the streets two weeks ago over his decision to pull out of an association agreement with the European Union, which would have established a free-trade zone and bolstered political and other ties between the former Soviet republic and the European bloc. The protests are the biggest since Ukraine's pro-democracy Orange Revolution. Those protests, also centered on Independence Square, known as the Maidan, succeeded in forcing the annulment of Yanukovych's fraud-tainted presidential victory in 2004, and ushered his pro-Western opponents into power. Yanukovych returned to the presidency in the 2010 vote, drawing on support from heavily industrialized eastern Ukraine where there are many Russian speakers.